Sitting before me on my desk is a pretty little pack of six scents that form the Van Cleef&Arpels Collection Extraordinaire. Taking on an entire collection is a daunting task, and a time-consuming one. But after I started to make my way through these perfumes, I really had fun, I rediscovered how exhilarating it is to find beautiful perfumes. To find so many, so closely together, in this tiny package was interesting and somewhat unexpected. Since mini-reviews are tops, to speak in the words of my best friend in perfume, the kind and wonderful Dee, here are all six perfumes of the Collection Extraordinaire. 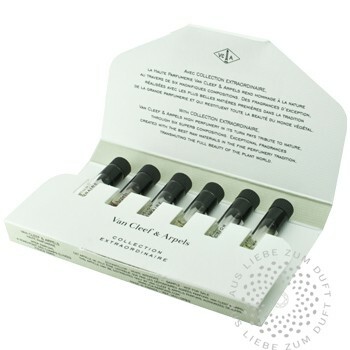 Created by Randa Hammami in 2009, it includes notes of Mandarin orange, litchi, bitter almond, dark chocolate, Bulgarian rose, violet, vanilla pod, cedar, tonka, and white musk. Orchidée Vanille is a wonderfully smooth gourmand that goes back to the root of vanilla – the tropical flower. Orchidée Vanille reminds me of Guerlain Spiritueuse Double Vanille in its boozy, languid and sensual sweetness that always safely stays on the far side of too much. Created by Natalie Feisthauer, Gardènia Pètale includes green notes, citrus notes, lily of the valley, jasmine, and gardenia. An awe-inspiring gardenia rendition, although I am in no way an expert on gardenia perfumes, as I usually tend to avoid them for the simple reason that I have not like any before. Gardènia Pètale is deliciously creamy, ranging from green buds to mature blooms, it offers great sillage, but no headiness, a hypnotic pull, but no narcotic heaviness. The most feminine and beautiful floral perfume, perfect for a bride. Created by Emilie Copperman, Bois d’Iris contains notes of iris, exotic wood and ambergris. A simple, uncluttered iris. The star ingredient stands on the stage only accompanied by a pianist (woods and salty ambergris) and sings her grey-powdery heart out. Elegant and timeless. It occupies the middle ground of “irisness” between The Different Company Bois d’Iris and Serge Lutens Iris Silver Mist. Created by Mark Buxton, Cologne Noire includes notes of bergamot, bitter orange, mandarin, ginger, cardamom, pepper and woody notes. Fresh, bracingly so, spicy, very much so and woody, smoothly so. That is Mark Buxton’s entry in the Van Cleef&Arpels canon. A classic cologne, made interesting and modern by its flower-less spicy kick. Created by Natalie Cetto, Lys Carmin includes notes of lily, pink peppercorn, ylang ylang, vanilla and sandalwood. Lily – soft, sweet, spicy, creamy and warm. A beautiful lily scent, Lys Carmin shows us a bouquet of lilies through rose tinted glasses, filtered of its heavier aspects, rendered mild and pretty. A de-weaponized lily, but very, very nice. I like this salty lily better though. Created by Antoine Maisondieu, Muguet Blanc includes notes of lily of the valley, white peony, neroli, and white cedar. This is the one I did not exactly run to try. I am not a huge fan of lily of the valley, although Diorissimo was my grandmothers signature scent. I associate it with her, but I don’t necessarily want to smell like it. Another huge lily of the valley (lotv) perfume, Andy Tauer’s Carillon pour un Ange cemented itself in my brain as the reference lotv, and it can be a bit overwhelming. Let’s just say, my lotv need is minimal. Maisondieus’s creation is subtle and minimalistic (at least when your comparison are the two perfumes mentioned above). It is very fresh and ozonic, a freshly cut stem of lotv still wet with morning dew, or even rain. The aquatic aspect is considerable. All in all, my least favorite of the lot. A seventh perfume of the line is out now, which I have not smelled yet – Precious Oud. I guess a house does not feel complete these days without their very own oud rendition. There is a pretty damning review by Octavian Coifan about Precious Oud, I’d like to take a sniff eventually anyway. Of the six I tried, I am content with my small samples of four of them, and will probably wear them from time to time. If I received a bottle of Orchidée Vanille, I would be very happy, but the one perfume I am considering getting more of, a decant, maybe even a bottle eventually, is Gardènia Pètale. The surprise winner for me, I never smelled such a likeable, beautiful and easily wearable and elegant gardenia. A must try. The Collection Extraordinaire can be bought at First in Fragrance. This entry was posted in Fragrance Reviews, Van Cleef & Arpels and tagged Fragrance, Perfume, Review, Van Cleef & Arpels. Bookmark the permalink. I’m happy you had fun with them. Those 6 took me by surprise and I enjoyed them sooo much. You know about my very limited “love” to white flowers (practically non-existent…), but here I liked even those. Understated, pure beauties. I hope if we keep saying that again and again more companies will respond. I’m thinking about buying By Kilian’s collection set just because he is one of the few who did what I always wish for with many perfume houses. I have the older eight perfumes set by Kilian, and I love it to pieces. Once it is gone, I’ll surely splurge for the ten perfumes set. Just, as you say, to let them know it is appreciated (and because I love nine out of those ten, which are extraordinarily good odds). 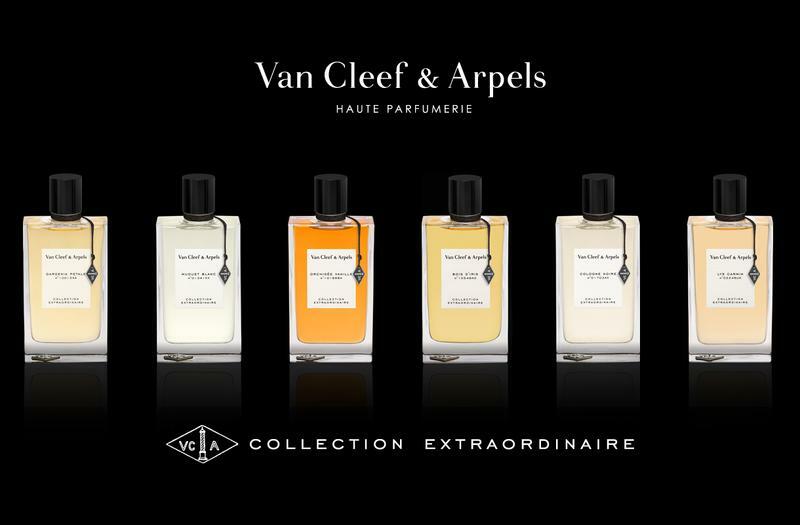 If there’d be a 15ml coffret (or even a 20ml one…) of Van Cleef & Arpels I’d buy it immedietely !!! I liked your mini-reviews. I don’t know why but I didn’t test any of those perfumes but the one which is your least favorite. I think those huge bottles scared me away. The next time I see them in a store I’ll try Gardenia Petale. They are well worth a sniff. I look forward to wearing Gardenia Petale again in warmer temperatures, I crave something else in winter, but it is really lovely! I have this little six pack too – swapped some Plum for it! I have tried them all at some point, and really liked the so aptly named “de-weaponised lily” (you can guess why… : – ) ). I clicked on your link to the salty lily, expecting to be taken to Vanille Galante (another lovely de-weaponized lily), and was interested to be reminded that Lys Mediterranee also has that quality. I have a couple of ml left of Plum. Gardenia Petale was absolutely my thing – too bad that this one “ist in die Hose gegangen” – quite literally! I loved Orchidee Vanille but not enough for the large bottle. The 10 and 15 ml bottles would certainly be perfect. Hmmm, now I have to out and smell Gardenia Petale again. Thank you for your reviews! Sounds like a classy and wearable collection. If both you and lady jane grey like the white florals, that says a lot! One more proof that the world of perfumes can surprise us so much in a most unexpected way, like you’ve said for a gardenia. Man can never predict from listed notes what the outcome will be. That is so nice in the perfume world. Isn’t it? Who would have thought I’d go for the gardenia? Not me. 🙂 But all the others are quite nice as well. Great review, I’m sure I have a sample of Orchidée Vanille somewhere, I really must dig it out! I love the sound of Gardènia Pètale, for I am very much a gardenia fan. I agree on your comment to Lady Jane Grey, they really should offer these types of perfumes in some smaller sizes – I rarely by anything bigger than a 50ml (and even then I prefer a 30ml) b/c I have too much to work my way through. Thanks, Stef! Orchidée Vanille is so cozy this time of the year. I must try the iris. The thing is tho’, I have a fear of falling down an iris rabbit hole. It sounds like a serious addiction, if I can so mix my metaphors. Mix away, but you are right, iris is dangerous! You have been warned! I enjoyed (and own *hem*) Bois d’Iris the most. I even like it better than the Bois d’Iris version by TDC because it has more depth and longevity. The rest of the line kind of vanished once I sprayed BdI but I’ll try to revisit them soon. Lys Carmin was the one I was most eager to try (since I loved Lys Mediterranée) but just like you, I found it less special / creative / distinctive compared with the F. Malle lily. I love mini-reviews! This was so much fun for me to read. Thank you! I need to try to snag this little set of samples as well. I’m glad you enjoyed the mini-reviews, Joey! Yay for mini reviews – this collection sounds good, I’m always a bit dubious of ‘high-end collections’ within a line but this one sounds like it’s worth they hype. Thanks for bringing it to my attention. You are welcome! It is a line where not only one or two are good, but it is very consistent in quality. Bois d’Iris is divine! Very solid and engaging. Spritzed a sample on my way to a work meeting the other day. Made me feel quite posh! It has a posh vibe, in a good way – I like it too.